The fern is often associated with lush, cool glades and moist valleys. Both indoors and out, the green foliage provides a sense of calm. While many varieties love damp, shady conditions, the fern can be found growing in a huge range of conditions on almost every continent. There are species native to desert, alpine, forest, meadow and wetland ecosystems. Not all are 'ferny' either, some like the shield fern, don't have tiny pinnae on their fronds, but have large, strap-like leaves, and Holly ferns have leaves like, well, holly. They are an ancient group of plants that do not produce flowers, but instead reproduces by means of spores. Outdoors, most plants enjoy consistent moisture and shade to part shade. Some varieties, such as Ostrich and Royal can grow in full sun if given very wet conditions. Look for plants that are native to your region. The leaves look great in naturalistic woodland gardens, perennial shade borders, along streams and pond edges, in containers and as groundcover. In warm climates, staghorn varieties can lend a tropical air to a garden when grown attached to a tree trunk. Tree varieties can also be quite impressive as the focal point of a garden bed. The following are beautiful and adaptable. In nature, ferns commonly reproduce through spores that can usually be seen on the underside of their leaves. However, gardeners find that ferns are most easily multiplied by division. For houseplants, divide when clumps get crowded or when lots of new offshoots are growing. Plant each section in a small pot. Ferns seem to prefer being somewhat root-bound so it is best to re-pot them only when they seem to be spilling out of the pot they are in. Select a pot only as big as necessary to accommodate the plant. A pot that is too big will encourage problems because of too much moisture. Be sure the pot you choose has drainage holes. It is also helpful to put some gravel in the bottom of the pot to keep the drain holes from getting plugged up with soil. Soil should contain organic matter like peat moss to allow proper drainage while also remaining moist. In the garden, divide established plants in spring before new growth appears. Dig up the whole clump and saw or pry the sections apart. Replant at the same soil level as before and water well. 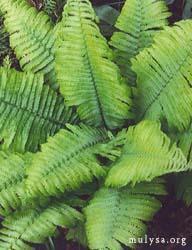 Ambitious gardeners may want to try growing them from spores.Sandy soil with good drainage is ideal for ferns in your landscape. If your soil has a high clay content, it can be easily amended by adding peat moss, compost or other organic materials.